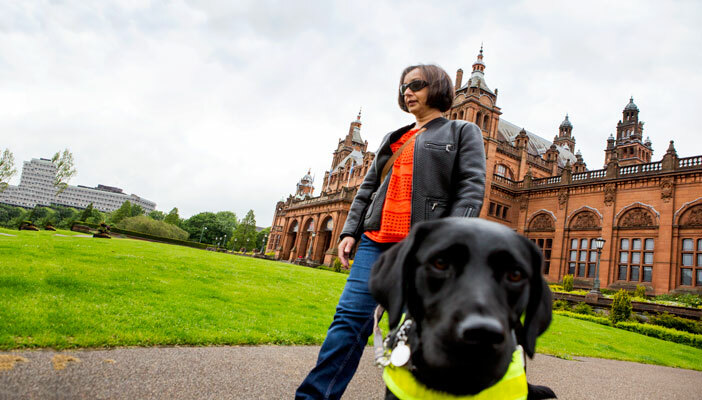 Scotland can be a kinder, safer, more inclusive place for people who are blind or partially sighted says RNIB Scotland. In its manifesto for the Scottish Parliament elections on May 5th 2016, RNIB Scotland insists the costs for its proposal are relatively modest, but the gains for some of the most vulnerable in our society would be far-reaching and profound. Around 180,000 people in Scotland have significant sight loss, of which around 3,000 are children. But these figures are projected to potentially double by 2030 due to our ageing population and persistently poor health record. Ross MacFadyen, interim director of RNIB Scotland, said: "Sight loss will, inevitably, be a more common feature of our society. It is vital, then, that we act now to contain preventable sight loss and maximise the independence of those whose vision cannot be saved." Among the things the manifesto, 'A Vision for a Better Scotland', calls for are more support for people who are newly diagnosed with sight loss, disability benefits that recognise the extra costs involved in being blind, and more accessible public transport. The Scottish Parliament already has full responsibility for health and social care policy in Scotland and is poised to take on new powers over some disability benefits. "Being told you are going to lose some or even all of your vision is devastating news," said Mr MacFadyen. "People need reassurance that they can find their lives and independence again, help that our hard-pressed health and social care professionals are often too busy to provide themselves. There are Vision Support Services in over half the health board areas in Scotland, but we want to make sure this vital support is available to everyone." RNIB Scotland is hopeful that additional powers will be devolved to the Scottish Parliament over disability benefits which could help make the welfare system more sensitive to the needs of blind and partially sighted people. The charity is also calling for mandatory training for bus and coach drivers to ensure they better understand the needs of passengers with sight loss who are often more dependent on public transport. "Little things like not moving off until someone finds a seat, or telling them when their stop has been reached can make a tremendous difference," explained MacFadyen. According to most surveys, sight is the sense that people fear losing most. "To be blind or partially sighted is to be more dependent on the good will and empathy of society," said Mr MacFadyen. "But with the right support and assistance, people with vision impairment can lead fulfilling lives. If we can make progress with these things in 2016 we will have made Scotland a kinder, safer and more inclusive place for anyone living with sight loss. "The costs are relatively modest, but the gains for some of the most vulnerable in our society are profound."